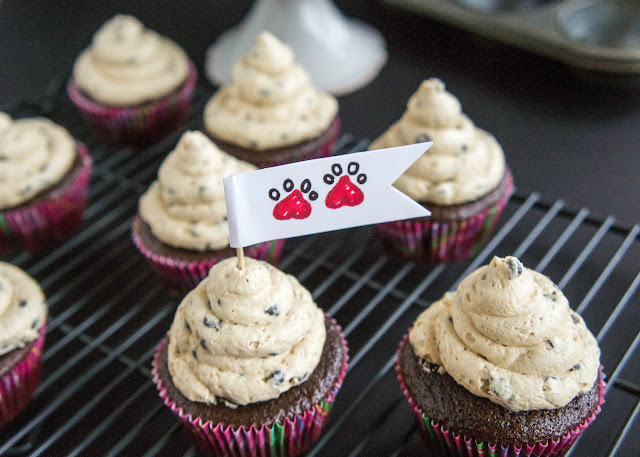 It’s National Cupcake Day in support of the SPCA and Humane Society! 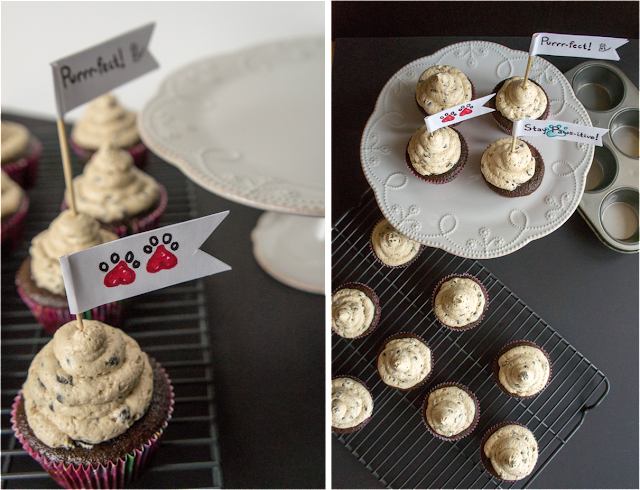 And really, any excuse to make cupcakes it a good one. But when you think of all the poor abandoned and abused animals out there that need our help, doesn’t that make it even more worth it to participate? For this cupcake recipe I wanted to do something really over the top. The inspiration came from “slutty” brownies that have been making the internet rounds. This brownie has been around my friends! It has had an affair with Oreo AND chocolate chip cookies. 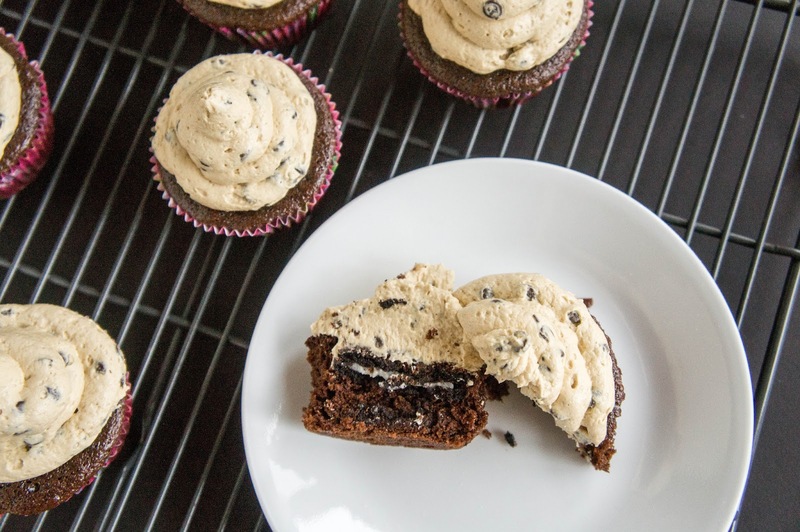 Essentially an Oreo brownie with a chocolate chip cookie base. With just a few modifications, vanilla swiss meringue buttercream becomes chocolate chip cookie dough swiss meringue buttercream. 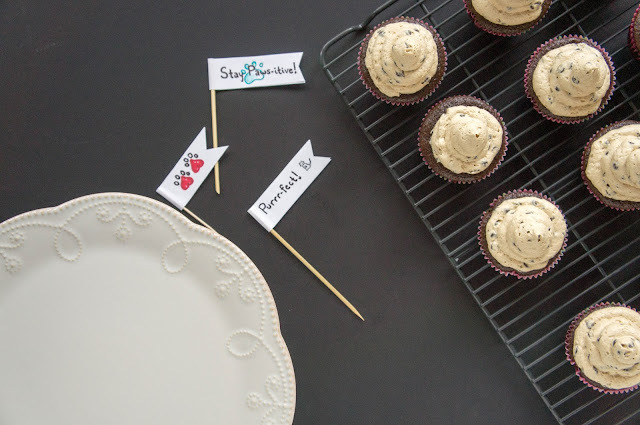 Brown sugar to mimic that classic cookie flavour, more salt to really give it the authentic cookie taste, and of course, mini chocolate chips to complete the ensemble. One thing you may notice when making the frosting is that the meringue is THICK. That’s because of the higher amount of sugar. This is normal, go with it. Once you add the butter it will become silky smooth. 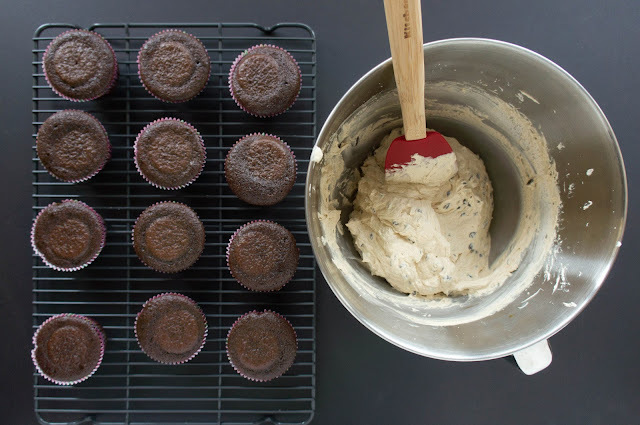 The cupcakes are rich and dark, and melt into fudgy goodness in your mouth just like a brownie. And the Oreo cookie just makes it ridiculous. This is really the ultimate decadent cupcake best enjoyed with a cold glass of milk or a strong black coffee. Preheat the oven to 350F and put 12 cupcake liners into a cupcake pan. Chop the chocolate into small pieces and melt either over a double boiler or in the microwave in 30 second bursts, stirring after each time. In a medium bowl, whisk together coffee, sour cream, vegetable oil, and egg. Add in the chocolate and whisk until combined (it may not look completely uniform at this point). In a small bowl, whisk together flour, sugar, salt, and baking soda. Add dry ingredients to wet ingredients and whisk until no lumps remain. 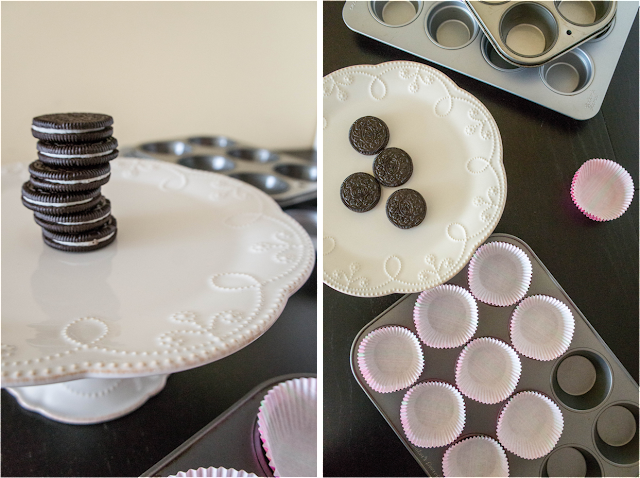 Pour a small amount of batter into each cupcake liner (mostly just enough to cover the bottom). Carefully place an Oreo horizontally on top of the batter. Pour more batter to cover the Oreo, filling the linear ~2/3 full. 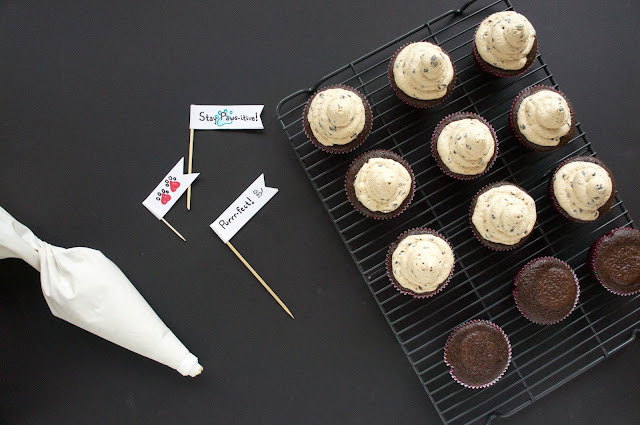 Bake in a preheated oven for 19 minutes (a toothpick inserted should come out clean with just a few crumbs on it, we want these cupcakes to be fudgy!). Let cool in pan for 15 minutes, then cool completely on a wire rack. Remove the butter from the fridge, cut into cubes, and leave at room temperature while you prepare the meringue. Place egg whites and sugars in a large bowl or in the bowl of your stand mixer. Whisk over a steaming water bath until the sugar is completely dissolved. This may take longer than usual since there is a lot of sugar here. The mixture should be hot to the touch and should have no sugar granules in it when rubbed between your fingers. 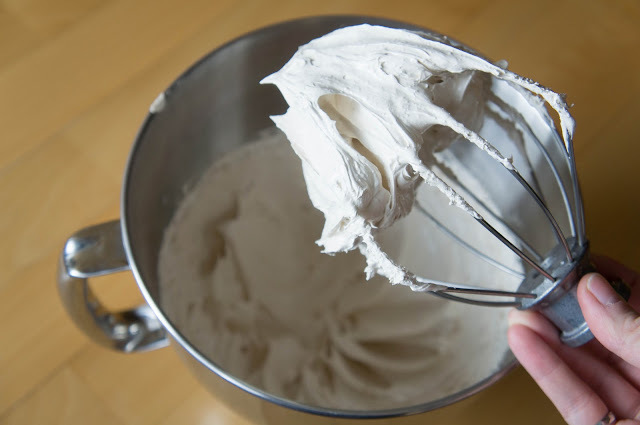 Remove from water bath and immediately begin to whip on high speed either with a hand mixer or a stand mixer with a whisk attachment until the meringue is thick and the bowl is back to room temperature. It will be very thick! Somewhere between a meringue and a nougat. Switch to paddle attachment if using a stand mixer. Add butter one chunk at a time mixing at medium speed until the frosting becomes smooth and satiny. If the mixture separates it may mean your bowl was still too warm when you started adding the butter or your butter was too soft. Just keep mixing until it comes together again. If it seems really soupy, refrigerate for 10 minutes and whip again until it comes together. Add vanilla and salt and mix to combine. Add mini chocolate chips and stir to incorporate. I frosted these cupcakes with no tip on the bag, just the coupler, to avoid getting the chocolate chips stuck, but it really shouldn’t be a problem with any large tip since they are mini chocolate chips. The cupcakes can be stored covered at room temp for a couple of the days, if they last that long.